These acidic feather dyes are made by W. Cushing & Company in Kennebunkport, Maine. Cushing has been making and selling dyes in Kennebunkport, Maine since 1879! 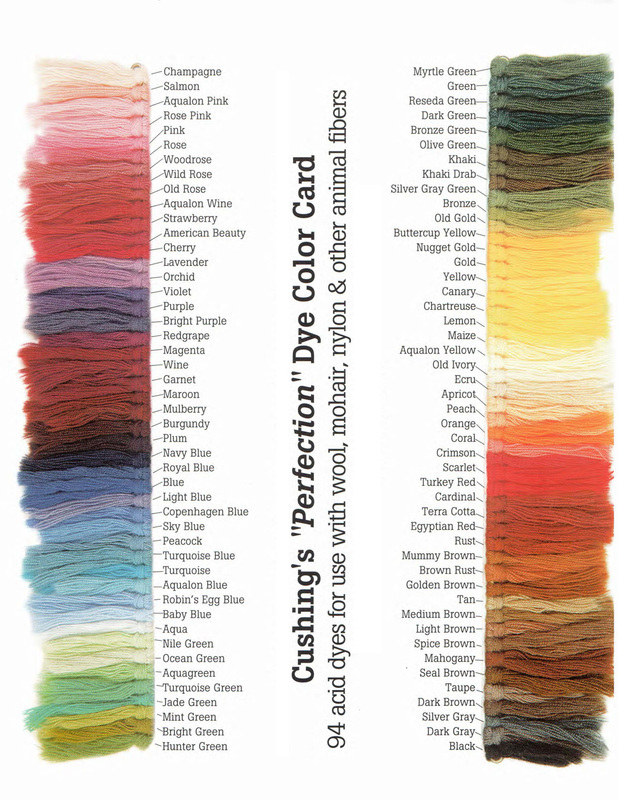 These are the same dyes we use at Moonlight Feather to dye our product. Over the years we have tried many types of acid dyes on feathers. We have found that the Cushing feather dyes give the best result. The feathers are color-fast and the process is easy. No harsh chemicals are needed. Just white vinegar, hot water and dye. Each shipment of acidic feather dye comes with instructions and a Material Safety Data Sheet. Make your own colors by mixing dyes. When viewing the color card, please note that the colors shown are wholly dependent on your monitor settings. If you wish to get a free printed copy of the color card, please let us know. These are based on a full concentration of dyed wool. Feathers will vary slightly in color. We carry all the colors of Cushing's perfection acid dyes shown below. If a color of Cushing feather dye you need is not listed in the buy section, give us a call and we can usually get it for you. All dyes are sold in 1/3 ounce bags. That's about enough for 1/4 lb of feathers.